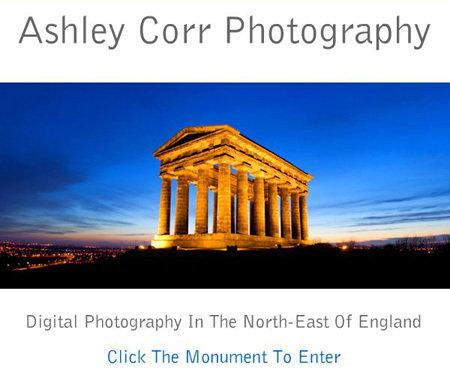 Just a quick one to let you know I'll be updating my website with new images over the next few days. During recent weeks my updates have mainly been in the form of new blog entries, right here, but that is about to change as I have a backlog of images that are ready to be uploaded. My blog will still have its regular updates but my main website galleries will now take priority, and about time too. That's all folks! Yes, I warned you of a backlog! It's time to catch up witha backlog of Tyne-Tees TV weather clips which recently featured my photographs. There's quite a few to get through, dating back to Spring 2010, so I'll kick off with a few now to get the ball rolling. The first clip features a night time shot of the 'Angel Of The North'. This was the very first low-light effort with my 'Then new' Canon 7D. The second shot is another low-light exposure, taken near the Blacksmith's Needle on Newcastle Quayside. Hope you like them. 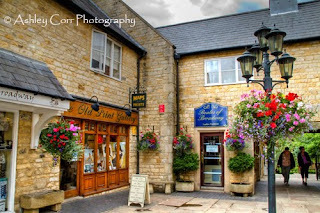 Broadway is rightly proud to have gained the reputation and recognition for being ‘The jewel of the Cotswolds’. 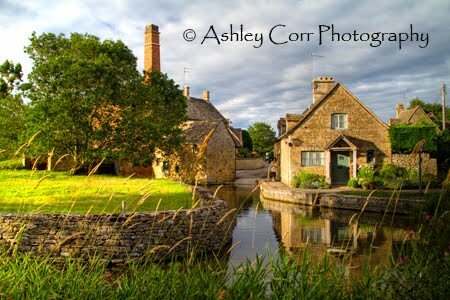 This picturesque village nestles beneath the Worcestershire hills of the Cotswolds. Today, Broadway attracts visitors from across the world – all drawn to the beauty and attractions of this quintessential English village. The wide main street (the ‘broad way’) is lined with red chestnut trees and historic honey-coloured buildings many of which date back to the 16th century. As well as it's wide street, Broadway's majesty is also a delightful mix of Tudor, Stuart and Georgian buildings. Broadway has a long and interesting history and there is documentary evidence of a settlement in this region dating as far back as Roman Times. This famous street was also voted the most beautiful street in the UK and on arrival it is clear to see why. 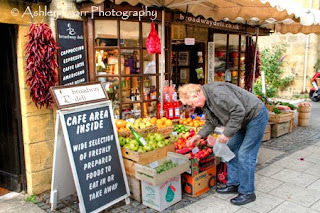 Broadway is lively and vibrant with an excellent range of unique shops and designer boutiques, restaurants and hotels but is also steeped in history. Over the centuries it has made its mark in many different ways. In the 1600's it was a major stopping place for the stage coaches that travelled between Worcester and London – with the world-renowned Lygon Arms remaining popular with travellers and visitors. After parking up we walked through a small arcade which brought us out onto Broadway. And broad it certainly was! Olde worlde architecture greeted us as we made our way up the street before crossing the main road and heading back down the other side. The place wasn't as busy as expected, although quite a few coach trips were coming and going during our one hour stay. below. At 1024 feet above sea level this is the second highest point in the Cotswolds. From the top of the tower is one of England's finest viewpoints with 13 English counties to be seen on a clear day. Ground level was the location of my photography today though. A wide lens would have suited me down to the ground today (no pun intended), but I had to settle with a standard 18-135mm job. It was up to the task, but photographing at closer quarters might have upped the game slightly, especially when getting close up to the fine detailed architecture itself. Here is a selection of shots from my debut visit to Broadway. A bit of mix n' match. Situated in the north Cotswolds, Campden is a perfect place to stay with plenty of accommodation. This charming old wool merchants' town straddles the nearby surrounding shire counties of Oxfordshire, Worcestershire and Warwickshire. From Blenheim Palace and the Cotswolds to the south, to Worcester and the Malverns to the west plus Stratford-upon-Avon and Warwick (with the best medieval castle in Europe) all within an hour's journey. Chipping Campden didn't feature in our Cotswolds visit of 2009, so it seemed a sensible choice to pay a visit twelve months later. And here we were, walking amongst olde worlde Cotswold England. In tradition with it's neighbouring Cotswold villages, Chipping Campden was another place that we wouldn't forget in a hurry. 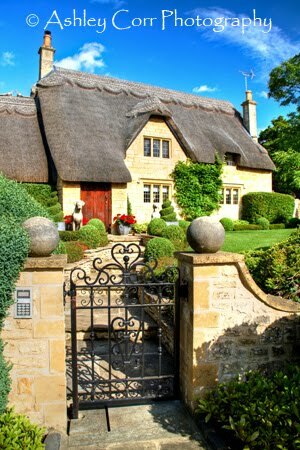 Well maintained and well presented, this is Cotswold Country at it's very best. We got a little bit off the beaten track and explored the back streets rather than sticking to the main street that split Campden through the middle. At the junction of Lower High Street sits St Catharine's Church, part of the Clifton Diocese. 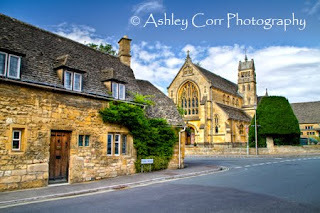 The church sits nicely on the edge of Campden, alongside the many terraced houses on each side of the surrounding roads. The bells chimed as I took the shot (above), adding to the whole experience of the Cotswolds and all it had to offer. The properties in Campden will set you back a few quid...not 'arf! I dread to think how much some of the larger plots would cost. But hey, you'd give an arm and a leg to own one of these fella's. It was another good day for the camera though, as Chipping Campden offered plenty to capture on memory card. Once again, this will be another place to add to the 'Must Revisit' list and hopefully it won't be too long before that happens. No matter how much you think you've seen, there's always the bits you miss. I'll have to put that right next time. 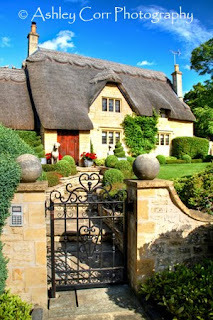 Deep in Cotswolds country lies the tiny picturesque village of Lower Slaughter. As the name suggests, Lower Slaughter is one half of two villages more commonly known as 'The Slaughters', with Upper Slaughter being the other half. After visiting Lower last summer, I was looking forward to seeing Upper in the hope that it was just as good as it's neighbour. Unfortunately Upper Slaughter was nothing to write home about so it made good sense to make the short drive to revisit Lower Slaughter, a place that seems almost lost in time. Last year the sun was shining and as night fell it cast a nice orange glow onto the Cotswold stone of the quaint village houses. This time around though, the sun shone very briefly before dropping behind a very large grey cloud, not to be seen again until sunrise the next day. The right light makes all the difference when photographing this type of landscape scene and I managed to capture one or two decent shots in those brief moments of ideal light. Lower Slaughter still remains one of the best places I've ever visited in the UK. It's certainly the best village for obvious reasons. During both visits we only passed a handful of people as we walked amongst its beauty. It really is a place that has to be visited, ideally in the Summer, but one can only imagine what it must look like after a heavy snowfall in Winter. Now, that would be a sight to see! 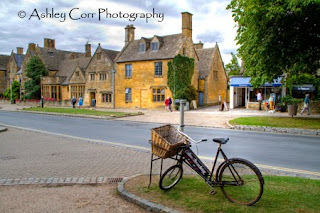 Next stop in Cotswolds Country... Broadway. Fowey is a small town, civil parish and cargo port at the mouth of the River Fowey in south Cornwall between Looe and Mevagissey. Quaint cottages, narrow steep winding streets with glimpses of the shimmering river below, busy with boats and yachts, cobbled walkways perfumed with flowers from hanging baskets and boxes. 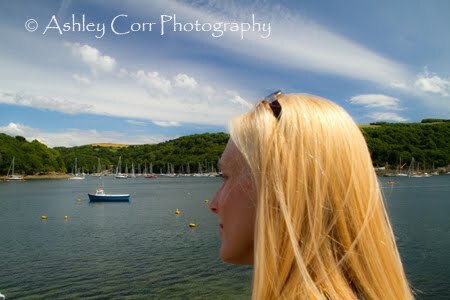 This is Fowey (pronounced Foy). Our afternoon in Fowey started off well, on the balcony of the Fowey Hotel with a cold one. Overlooking the harbour on a sweltering hot day with a pint of Carlsberg - doesn't get much better really. Pint down, it was time to check the place out, so we headed down to where it was all happening. The place was well busy, as expected at this time of year, and the weather made our visit all the more enjoyable. The narrow approach roads to the town centre were a bit scary, especially with busy traffic and the need to 'Keep in' as it passed. At the waters edge people dined at an exclusive restaurant which was throwing out some quality aroma from it's kitchens. And there was me, cornish pasty in hand - livin' the dream...NOT! We sat for a while, taking in the views across the marina towards Bodinnick and also over the water towards Polruan, another village that typifies the whole 'Look' of Cornwall and it's coastal fishing ports. Mrs Corr certainly enjoyed the views (see picture). The surrounding coastline of Fowey is popular with fishermen and spear-fishermen. Many sea creatures can be seen all around the Cornish shoreline, including mullet, bass, mackerel, lobsters and cuttlefish. 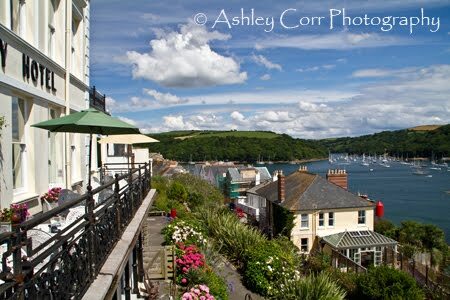 The seafood served in many of Fowey's restaurants and comes from the Fowey estuary, or the sea just outside it. Well, visiting Fowey wrapped up out visit to Cornwall and it was a good way to end another holiday before the long journey back up north. Again the journey would be split in two and the half way point this year would once again be the Cotswolds, as in 2009. 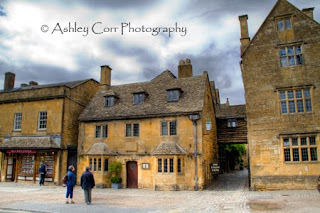 Last years visit to the Cotswolds is featured in my blog, beginning with Bourton On The Water, followed by Lower Slaughter. It might be worth revisiting these pages before I tell you about our return...coming soon! The Minack Theatre is the most famous cliff theatre in Britain, possibly in the world, carved into the granite cliff overlooking the spectacular panorama of Porthcurno bay. Its summer season of plays, opera and musicals runs for seventeen weeks from May to September. Also on the site is The Rowena Cade Exhibition, which tells the remarkable story of how a girl who enjoyed the gentility of Victorian Cheltenham grew up to build an internationally famous theatre with her own hands. 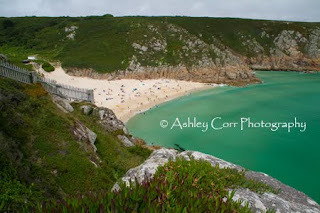 "Minack" in Cornish means a rocky place and in the 1930’s there was only one house here and it belonged to Rowena Cade. She was born in 1893 in Derbyshire. The Cade's moved to Cheltenham when Rowena's father retired in 1906. When the First World War broke out, she went to work selecting and breaking horses which were shipped out to the front lines in France and Belgium. With the war finished, her husband was dead and Rowena's mother sold their home in Cheltenham. Rowena discovered the Minack headland, when renting a house at Lamorna, and bought it for £100. There she built a house for herself and her mother using granite from a St. Levan quarry. She offered to let local friends put on "The Tempest" in her gardens, using the rugged coastline offered an appropriate backdrop but there were no seats for the audience. So she set about constructing what we know today as the Minack Theatre.It took six months for Rowena and two Cornish craftsmen to build a simple stage and some rough seating. The first performance of "The Tempest" in the summer of 1932 was lit by batteries, car headlights and a power feed brought down from Minack House. Until then the nearest she had come to manual work was sewing and mucking out horses. During that first winter of 1931-32, she worked as a labourer for her gardener Billy Rawlings and his mate Charles Thomas Angove. Granite was cut by hand from local rock. The terraces were in-filled with earth. Over the next seven years the theatre was improved. Then with World War II the army took over the site, and by the end of the war it had virtually returned to nature. Yet Rowena slowly brought the Minack back to life. She converted the gun post the army had built into the theatre's Box Office. Through the early fifties she and Billy Rawlings completed an access road, a car park and a flight of 90 steps up from the beach. Unable to afford the cost of granite, she had developed her own technique for working with cement. She fetched sand from Porthcurno beach initially with bags on her back and then in her cars. She worked each winter in all weathers until she was in her mid-eighties. 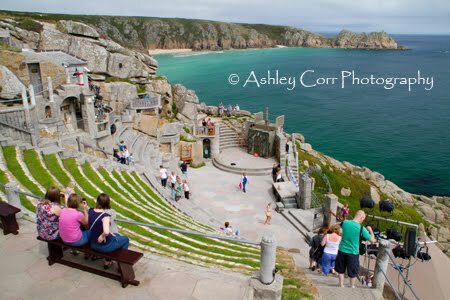 Good amateur theatrical groups are encouraged to play at the Minack Theatre. Michael York, Sheridan Morley, John Nettles, Sue Pollard, Sarah Brightman, Will Self, Jack Shepherd, Hugh Dancy and Charlotte Church have all appeared on the Minack's stage. In 1976, when she was well over eighty, Rowena Cade gave the Minack Theatre to a Charitable Trust which was set up to receive it. The Trustees extended the season of plays, built a Visitor Centre which is open all year round. This has attracted larger audiences and at last the Theatre is able to pay its way. The views from the Minack are outstanding and the beach below at Porthcurno Bay can be seen from a fine viewpoint within the coffee shop. The theatre seating plan consists of the main auditorium and the upper terraces, with seat prices ranging between £8 and £9.50 per show. 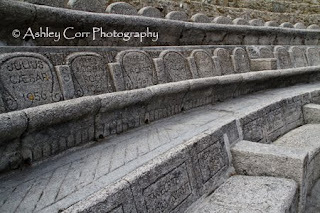 The first few rows of seats have the names of well known stage plays carved into them, adding more character to the place. Our stay was quite brief. The weather here was nothing to get excited about, although the sun did present itself for a few minutes. A large photo of the theatre was on display in the main reception and it was taken on an ideal summer's day, giving a fantastic panoramic view of the theatre with Green Bay and Logan Rock in the background. I might have achieved a similar shot myself, had the weather been kinder, but I was out of luck. Still, this was another place that was well worth visiting in Cornwall. Recommended. Mevagissey is a traditional fishing village on the South Cornish coastline with a fascinating history. 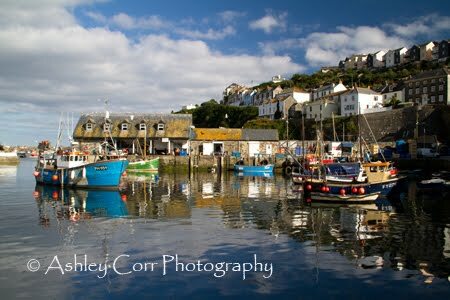 Mevagissey and the surrounding area provides many things to do, but when just want to get away from it all Mevagissey is ideal for that too. Here you can watch the catch of the day come in, which will be served to you in the evening with fine wine in excellent restaurants, while the fisherman can be found sampling Cornish ale in the local taverns. 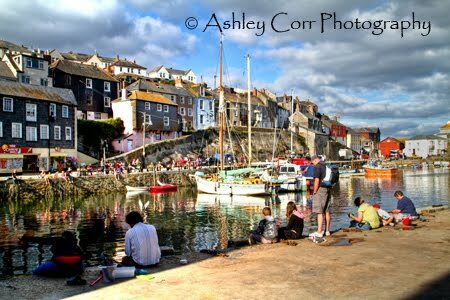 The village's maze of narrow alleyways, small coves and great cliffs will bring to life stories of Mevagissey's smugglers and intreague the explorer inside you. The gift shops and art galleries will inspire your creative side and the many walks in the area will put you in touch with the beauty of Cornwall. It is an ideal base from which to explore Cornwall and The Rosaland Peninsula. The village remains unspoilt and offers everything that you would need to enjoy a nice holiday in Cornwall. Today the weather was perfect. A Summer's day in a prime spot of Cornwall, not much more to ask for really. A crab net and some bacon as bait gave us an hour of light entertainment as the sun beat down. My son Christopher was pulling in crab each time he brought the net back up and there was suddenly a friendly competition sparking up along the harbour wall where everyone fished. The smell of fish and chips wafted past, eventually getting the better of us, which eventually saw us heading for a bite to eat. The tide eventually retreated and as the sun set behind us it suddenly became a tad chilly. Time to head back to the car and call it a day. If you ever visit Cornwall, be sure to stop off at Mevagissey. 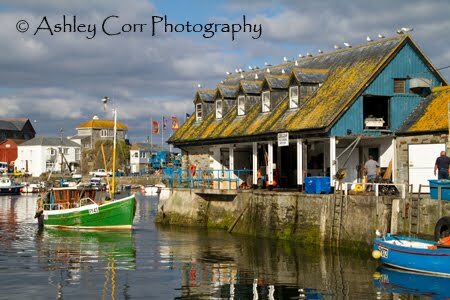 This is a traditional Cornish fishing town that typifies Cornwall itself and I couldn't imagine driving past it without paying a visit. For the photographer there's more than plenty to see and record on film (or even memory card, as it is these days). As always, if you get the weather then you're laughing. These are three shots from a bunch I took on our second visit to Mevagissey.